The sad truth is that most people take few steps to protect what they own. And rarely do they take steps in advance of a problem. When do most people act to protect their hard-earned assets? Usually after the damage has already been done. Hindsight is always 20/20. No one wants to think about things like business or professional failures, lawsuits, a financial crisis, social or political disruptions, death, taxes or divorce, to name but a few. But, with just a little bit of foresight and planning, you too can substantially reduce your risks. And too, you can save your family tens - or hundreds – of thousands of dollars on your estate taxes, or even cut your current tax bill this year. The good news is that protecting your assets is a lot less complicated - and a lot less expensive - than you probably imagine. For example, there are many simple and inexpensive little things you can do right now, which will cost you virtually nothing but a little bit of your time. Taking on-board any one of these steps could greatly reduce your chances of being the victim of a high-priced lawsuit. What's more, there is a whole world of opportunities for profits, privacy, superior asset protection - and reduced government interference - with a bit more advanced planning. Thousands of smart, forward thinking people are already taking advantage of these perfectly legal opportunities right now ... and you can do the same. "David Tanzer's two decades as a trial litigator provide him a valuable and practical approach to asset protection planning." Over the past 30 plus years, David Tanzer has worked in Law and Business, and representing clients as a civil trial litigator. 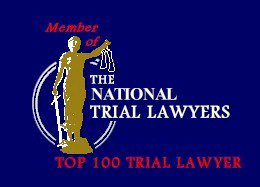 David was named a Top 100 Trial Lawyer by the American Trial Lawyers Association, and also by the Million Dollar Advocates Forum. He's taught post-graduate international law courses on international asset protection and international trade transactions, is a former judge, a member of the Oxford Club Wealth Advisory Panel, and The Offshore Institute. Perhaps you have seen David discussing wealth preservation techniques on CNN or CNBC. David has helped create hundreds of asset protection plans..... and as a former trial litigator he has helped tear just as many apart in the courtroom. He has seen what works - and what doesn't work - when it comes to protecting assets. Today, David takes on very few new clients and concentrates primarily in protecting assets. His mission is to let people like you know the truth about what you can and can't do to keep what you own. If you don't think you are at risk today, think again. A new lawsuit is filed every 20 seconds in America…. and your chances of being sued multiplies as the value of your assets increase. Don't think a frivolous lawsuit can happen to you? It happens repeatedly..... usually to decent, unsuspecting, and unprotected people. But there's more. What's worse, political and social changes are occurring before our eyes. It pays to plan ahead for what might happen next. If history is our guide – and it usually is – those that planned ahead were far better protected than those who failed to take steps in advance. Think for a moment what’s going on around you today. Look at the people you’ve seen or heard about that didn’t plan ahead and lost everything. Not just in America today, but throughout history as new government social and political agendas are ushered in. The threats to personal and civil liberties – and certainly against individuals with even small accumulations of wealth – are staggering. However, you rarely hear or read about those who took steps in advance to protect themselves. Why? Because they were a non-event…. privately, in control of their life, and their personal and financial affairs. Do you really trust others and government busy-bodies having access to every financial and personal detail of your life? 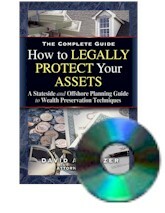 David puts his 30 plus years experience into what we believe is the best, easy-to-understand layman’s guide, covering virtually all aspects of asset protection in his book How to Legally Protect Your Assets, 2nd edition. There's no such thing as a one-size-fits-all plan. And whatever you do, avoid a legal planner or other counsel lacking litigation experience. What's more, stay clear of those pre-packaged trust plans: they simply won't stand up in court...... which is ultimately where your assets could be challenged over time. And make sure your planner is well seasoned with first hand international legal and business experience. Another important tip: Money drives the litigation engine and challenges against assets. The less money available to be reached by others, the less likely you are to be challenged….. and the better the chances of stopping threats in their tracks. For example, minimize the assets available to plaintiff's lawyers – or better yet, force the battle offshore - and you'll increase your chances of coming out way ahead. It's all about leveling the playing field. And with a bit more planning, you could also legally reduce the amount of taxes you'll have to pay. Anyone with even a small nest egg needs some level of protection. How much protection depends on many factors: your risk profile, future earning potential, the type and value of assets you own, whether or not you are active in a business or profession, where and how you want to live when you retire.... and certainly what’s in store politically and socially at home. How to Legally Protect Your Assets …. The new, updated 2nd edition, introduces you to the basics. Like building blocks, see the techniques applied for real people - and in real courtroom situations. … and much more information, packed into 400 pages in easy to read layman's terms. David's book includes how international trusts work, insurance, Wills, IRS audits, avoiding the courtroom, handling debt, owning property, prenuptial agreements, domestic trusts, business structures, the best offshore havens, offshore banks, second passports, living overseas, expatriation, privacy, limited partnerships, and planning for the elderly, to mention a few. "David Tanzer dissects the complexities of wealth protection planning. He presents today's best opportunities for preserving assets, saving taxes, and avoiding litigation." Start using the steps outlined in David’s book today to help you start your own asset protection plan. These same steps have been used successfully - across the U.S. and around the world - by likeminded people, for generations. And before you spend hundreds, or thousands of dollars in lawyer's fees or attend another seminar, have a look at the book that has been more than 30 years in the making. "How to Legally Protect Your Assets is easy to understand, and the techniques easy to apply." Leonard Matheo, CEO, Courtroom Performance Inc.
How to Legally Protect Your Assets, 2nd edition, is a 400-page book and includes a complimentary 100-minute DVD for less than a fifteen-minute consultation with a good lawyer. At only $59.95, this small investment will pay for itself many times over. Or, an eBook in Kindle or PDF formats for only $39.95. Examine the Table of Contents before you buy. You be the judge. Take the first step now to protect your assets. If you wait until you need a good asset protection lawyer, it will most likely already be too late. And don't forget, if you’re interested in learning about a wide range of topics on living and investing offshore, Offshore Living & Investing, Planning Strategies for the Sovereign Individual, 2nd edition, is the most comprehensive book on the subject.... before you make the next move. And if you're ready to discuss first-hand your personal planning options, Email David Tanzer with your thoughts.